Cheung Chau is shaped like a dumbbell. It is the busiest outlying island in Hong Kong. In the past, the fishing industries and the market town there were very prosperous. 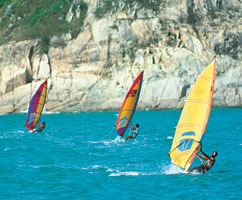 Today, it has become an attractive place for local holidaymakers during weekends. Take the ferry at the Outlying Islands' Ferry Pier No. 6 in Central. 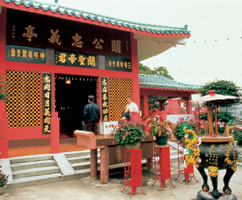 The Pak She Tin Hau Temple is one of the four Tin Hau Temples on Cheung Chau. 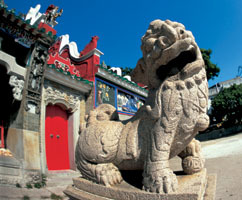 Tin Hau is the goddess who guards the fishermen. As Hong Kong used to have many fishing villages, believers in Tin Hau are numerous. It is also called the "Yuk Hui Temple" and was built in 1783 (the reign of Jian Cheng of the Qing Dynasty). It is dedicated to Pak Tai, that is "the God of Zhen Wu Xuan Tian in the North". The legend says that Pak Tai defeated the devil. This traditional Temple was built in 1973 and is dedicated to the god of justice Kwan Tai who symbolises gallantry and loyalty and has many believers in Hong Kong. 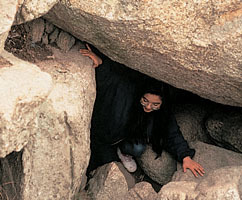 This small cave is said to be the place where the 19th century pirate, Cheung Po Tsai stored his treasure. Cheung Po Tsai was active along the Guangdong coastal area during the Qing Dynasty (1644-1912). His followers reached 40,000 and they had up to 600 ships. He capitulated to the government in 1810. Tung Wan and Kwun Yam Wan are very popular among holidaymakers. Apart from the comprehensive water sports facilities, it is also the home base for Hong Kong's first Olympic gold medallist, windsurfer, Ms Lee Lai-shan.